This is nonsense. It's not scheduled at all and happens far too often. It's disruptive, spontaneous, and destructive to home businesses. There's no forewarning or notice given to customers. There's no schedule to be found anywhere, even your own customer service reps have no idea that this even happens or exists. There's just a lot of lies fed to customers. Just more of the same bad service & support day in and day out. Edit: Even more ridiculous is that your support reps are being fed scripts to tell your customers that "The work is unexpected, they're out installing new cabling." 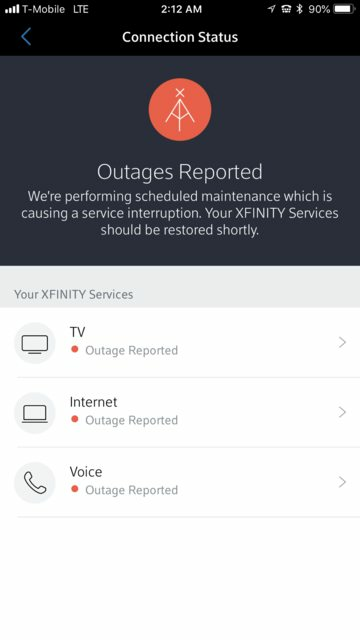 Scheduled maintenance is not unexpected. Installing new cabling is not unexpected. Technicians out in the field doing paid work is not unexpected. The lies you feed your own employees and customers is appalling. "Scheduled" is the opposite of "unplanned". Unplanned could be anything from a natural disaster to a car accident that takes out a pole. Scheduled maintenance just means they are repairing or upgrading the system.